Ken and I are so very thankful to have had the opportunity to be led to this amazing province of Nova Scotia. We share your Thanksgiving and know how blessed we are. Wonderful composition to express your loving thoughts. Thanks, Louise! I'm off to my sister's in a couple of hours. She lives in Vancouver so we're a ferry ride away! Beautiful still life. Bright and colourful and beautiful! Wonderful shot for thanksgiving. Have a great time! Happy Thanksgiving to all our Canadian family and friends.. Enjoy your day. Wonderful composition done with great taste. Is it Thanksgiving for Canucks? Cool! Happy Canadian Thanksgiving! Nice capture! @jrambo001 'tis indeed! Lucky American visitors score two turkey's a season! Beautiful composition and so special! Thank you very much for these good wishes! Lovely tribute Louise. The colours are stunning. Fab colours I'm this and great composition. We have family in London, Ontario and Nova Scotia. Hope you had a wonderful Canadian Thanksgiving and many thanks again for hosting us when we came by. It was a wonderful evening! @kass You're so welcome and we really appreciated that you came for the evening! We had a lovely Thanksgiving with friends living here from Alberta. We're having another Thanksgiving dinner and all the trimmings with friends around the corner on Saturday. And Ken and I decided to have an "American Thanksgiving" open house in Nov as it won't be long before we return to the states. @lynnz Thanks, Lynn! You're "a color person"...you'll appreciate this story, I think. A number of years ago I took calligraphy from a well known calligrapher whom I respected immensely. Before beginning on one of our projects, she took a handfull of skeins of embroidery floss and as she lay them down, she asked us to respond to the blending of colors. All went well until she threw down rust, orange, green, and burgundy. Several students groaned and some said they didn't like those colors together. (I, personally, was digging it!) After a pause, she said, "Have you ever looked at a rooster?" She went on to say, just look for inspiration around you. God doesn't get the color palette wrong... That lesson is with me every day, and I love remembering her words! gorgeous, gorgeous shot, louise. it looks like 3D from here, embossed on the screen and i touched the screen just to make sure my eyes (they're bad to begin with) aren't tricking me. great shot and wonderful colours! 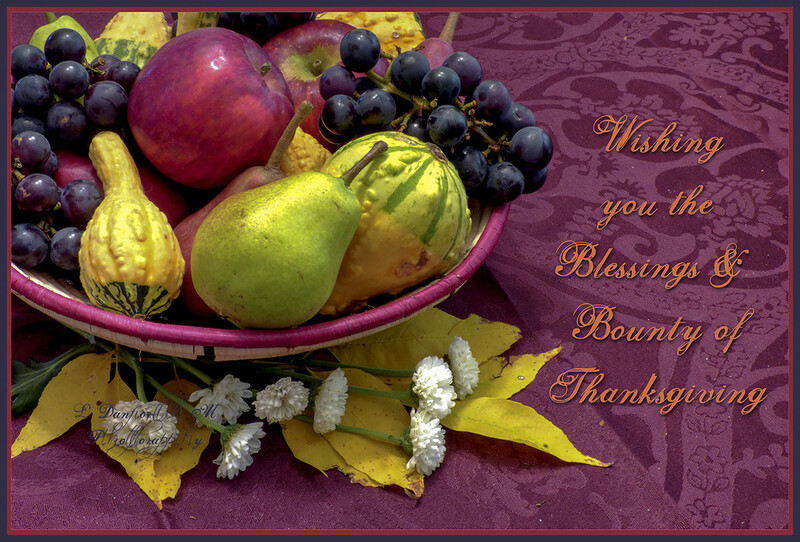 What a lovely still life, didn't know Canadians celebrated Thanksgiving on a different date.